The first horseless self powered human transportation carriage was in 1769. It was a steam powered vehicle meant to transport humans. In 1807 Francois Issac de Rivaz created the first automobile with a internal combustion engine using Hydrogen and oxygen. It also came with an electrical ignition system. Sadly, it wasn't successful. The only hint as to why is an 1824 paper that explains scientifically why the various tried fuel alternatives weren't effective and how they could be made more efficient. But by this time, Francois had moved on to other inventions. Gasoline was not a viable alternative until the carburetor was invented in 1876 by an Italian named Luigi de Cristoforis. This enabled liquid gas to be turned into a combustionable air mixture. Not uncommon in times of new and changing ideas, more than one man will create similar solutions to the same unsolved challenge. Karl Benz created his own carburetor around this time and then proceeded to build what is considered to the first self-contained fuel driven vehicle in 1885. In addition, several more carburetors were invented around the same time, which resulted in other vehicles being built. Okay, I'll admit, it looks more like a giant tricycle than a car, but the important part, hiding beneath the seat is what mattered. A one cylinder, water cooled, engine with a four stroke carburetor which could move the tricycle up to 16 kilometers per hour, or approximately 10 mph. Sadly, it was limited by law to a speed of 4 mph so the horses wouldn't feel inadequate and get depressed. With all those different carburetors out there, new automobiles began to pop up all over the place. However, at first, only the very wealthy could afford them, and they were still seen as undignified, so the market grew slowly at first. You'll notice most had a tiller rather the a wheel and a very loud horn to terrify horses and humans alike. The Audibert is the exception to the tiller. It boasts a double wheel, no apparent horn, but some very impressive lamps. It also has a second seat which means a driver could be hired. Note the engine is up front, far away from the passengers. In my opinion, this car catered to the wealthy who did not wish to be unseemly. Not to be out done by the competitors' four wheel, more substantial products, Karl built a four wheeler as well. However, unlike his competitors the engine still resides beneath the seat. I don't see any difference between the 1892 & 94 versions of the Panhard Levassor, but by putting two men in the picture, you can grasp how small it is. Honestly, I think I'd be more comfy in the trycyle. In America, we often think of Henry Ford as the father of the automobile. Yet, the first patent for an automobile was given to Oliver Evans in 1789. I did more research about the man and discovered Oliver was really good at filing for patent requests and enforcing his claims, but weak on actually building anything. Also, it turns out his patent was a steam engine device so it really doesn't count. Never Mind. 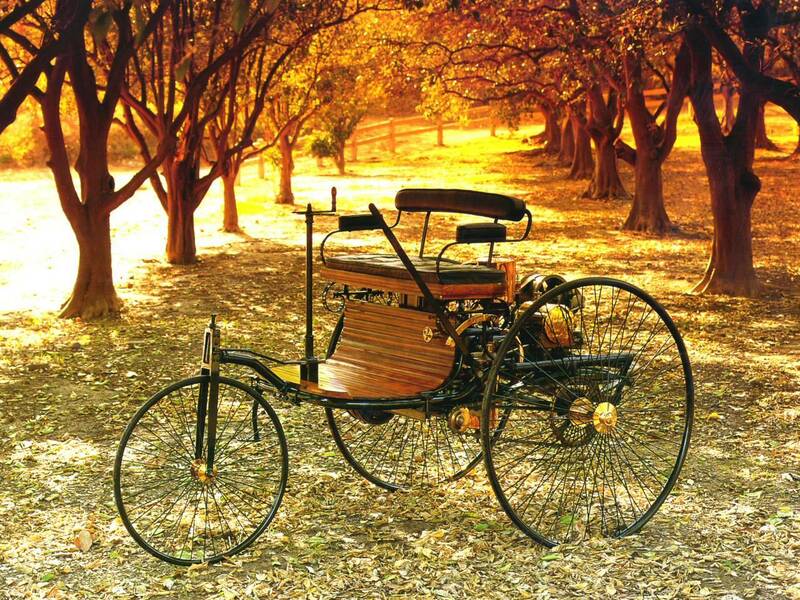 Throughout the Regency &Victorian era, inventors worked on making a carriage driven by batteries. 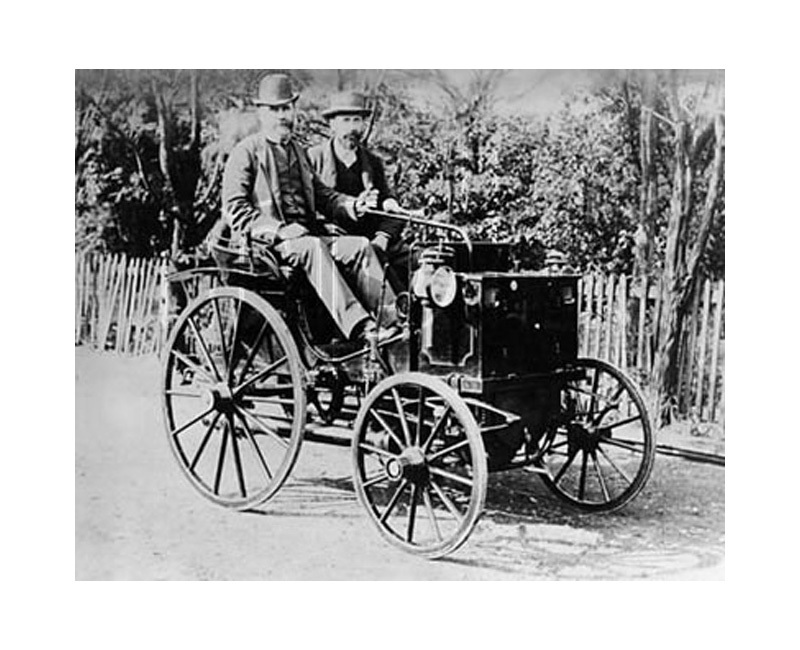 Electric cars claimed a brief moment of popularity in Late Victorian and early Edwardian eras. They were quiet, dignified, and much easier to control. But if the battery died before you arrived at your destination, you would be in a bit of fix. Whereas, all the noisy, troublesome gasoline driven contraptions soon acquired electric starters and you could carry additional containers of gas to go anywhere you wished. However, finding fuel would be a problem there as well. The electric car was deemed so easy that even a woman could drive it. Eventually, dignity of transport gave way to reliability over time and the beautiful carriage above traveled no more. In 1897, a fleet of electric cabs, were established in London. They were called hummingbirds due to the noise they made. 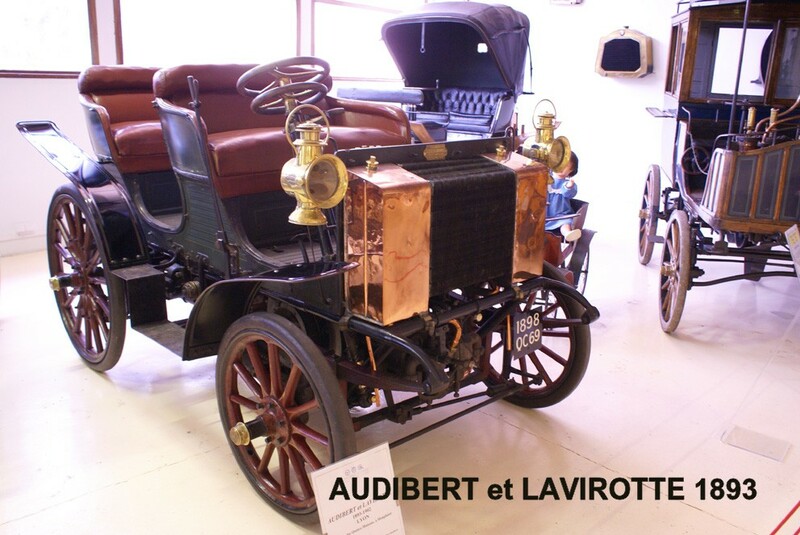 In my historical Xavier & Vic series, which begins in 1893, Vic comes upon a client who has purchased an early Panhard Levassor which Vic finds most interesting, but not terribly reliable or practical for her. None of these automobiles could possibly carry her giant protector, Sonny Tubs. The guy is 7 foot tall and weighs 400 pounds. She had to have her very large carriage fitted with the strongest of metal springs to carry Tubs' and her about. No way would these fragile autos withstand such weight. So Vic does not get a car. Sorry Vic, but we have to keep you alive. You're too adorable to lose. One final note: by 1986, the speed limit for cars was raised to 20 mph in England. That must have been a frightening time for horses. Labels: Liza O'Connor investigates, Victorian automobiles. I'm sure that the horses were quite frightened because now they might be out of a job and end up in the glue business! Seriously, those cars are amazing. I was able to sit in an early one at the Henry Ford Museum in Dearborn, Michigan. We could fit four of us in the buggy but I wouldn't say that driving was reliable. The road system wasn't in place yet, so the dirt roads sometimes weren't the best way to get around. The narrow wheels meant that often times the cars became stuck and you needed the horn to alert others so they wouldn't run into you! They were only allowed to drive 20 mph so if they ran into you, they weren't paying attention, and the cost would be high since finding a mechanic was nearly impossible. I love them, then again, I love carriages. Great post Liza. I tweeted and shared. I love the electric carriage. I wish I had one.